So it’s that time of year where we all eat way too many cookies and treats in honor of the upcoming holidays. I decided to contribute by making cookie plates for all of my friends, co-workers, and the other people I wanted to thank. The list got kind of long and I ended up doing five different kinds of cookies (with four of the recipes doubled). I might have been a bit too ambitious because it ended up taking nine hours. But oh well. They all turned out well and I made so many that we had lots of leftovers! 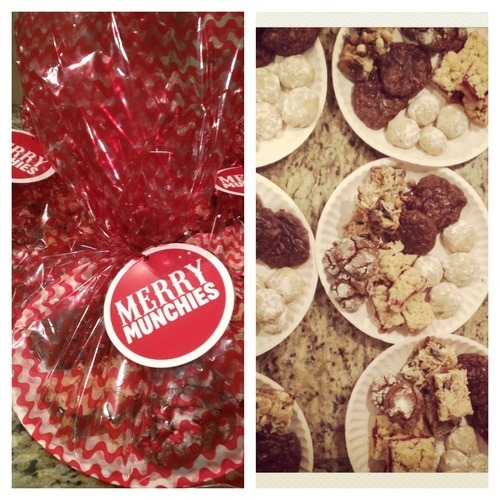 I made chocolate hazelnut crinkle cookies, seven layer bars, Mexican wedding cookies, double chocolate peppermint cookies, and cranberry streusel shortbread bars. This week has been crazed (last minute work trip to Boston and my brother is visiting), but I at least wanted to share one recipe with you. I’ll try to get the others up as soon as possible! I found this recipe in one of my mom’s cooking magazines a few years ago, and I have been making it every winter since. These are delicious and really festive looking! 1. Get your pan ready. I always use a 13 x 9 inch metal pan. To make the removal process later easier, line the pan with foil. 2. In your electric mixer with the whisk attachment, mix the melted butter with 3/4 cup of the sugar. Add the egg yolks. Now switch to the paddle attachment and add your flour. Once the dough is mixed, take two cups of the dough out and spread it evenly in the pan. 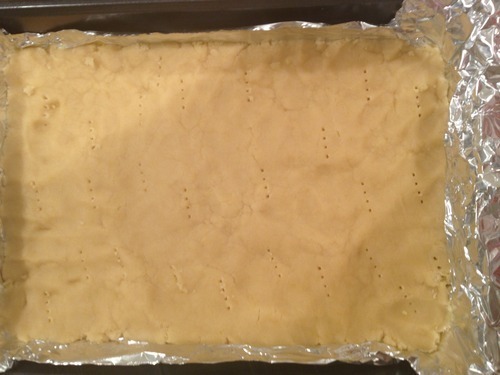 Use a fork to poke holes in the dough, then place it in the fridge for 30 minutes, or in the freezer for five minutes. 3. 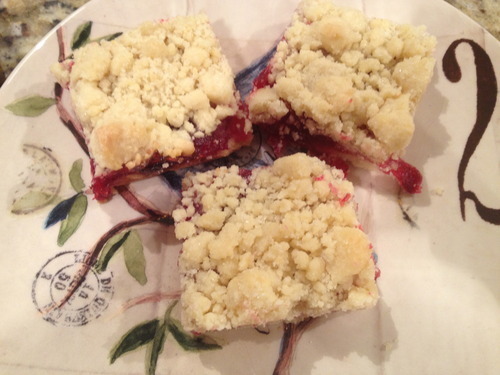 With the remaining dough, add the last bit of sugar (1/4 cup) to create your streusel. 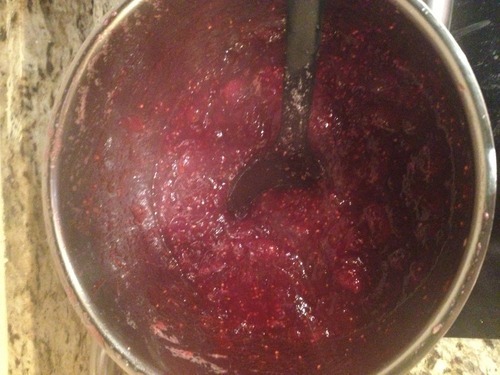 You want to use your hands to mix this in, but don’t let it break up too much. Now set this aside. 4. While the dough is setting in the fridge or freezer, heat the oven to 325 degrees. You want to bake the dough for 20 minutes. You’ll know it’s ready to come out when it has started to set and is getting a tiny bit brown around the edges. 5. While the dough is baking, prepare the cranberries. 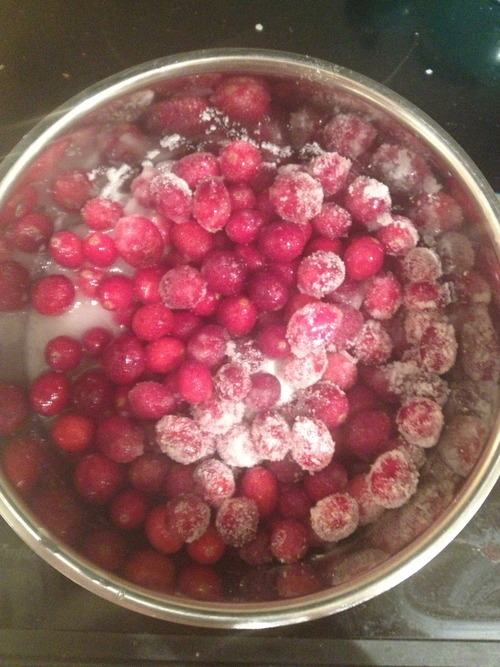 In a pot, bring the cranberries, sugar, and 1/4 cup water to boil over high heat. 6. Once it is all boiling, reduce the heat to medium high, and continue to cook until the cranberries start to turn into a thick syrup. I find it helpful to stir the mixture regularly while it is cooking. This tends to take me about ten minutes. Once it is done, take it off the heat and it will continue to thicken. Let it sit for at least ten minutes before putting it on the baked dough. 7. Once the dough is done cooking, take it out and increase the temperature to 350. 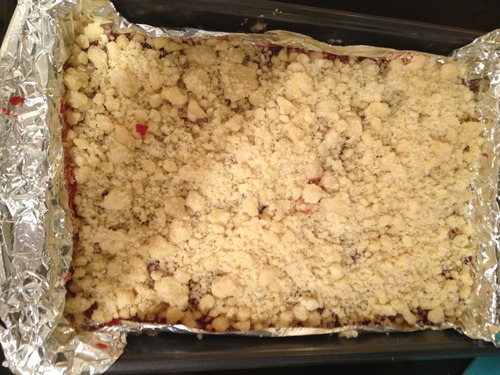 Then spread the cranberry mixture evenly on the dough, then sprinkle the top with the streusel. 8. Now, you’re all set to finish it off. Put it into the oven and bake for 25 minutes until the streusel has started to turn golden. Once the bars are all done, I’d let them cool for awhile before trying to cut them. You can either let them sit for an hour, or put them in the fridge for 20 minutes or so. Once they have cooled, you should be able to use a spatula to easily separate them from the foil. I also find it easier to cut them with a pizza cutter. 9. Now go give them out to all your favorite people! PS- I love these goodie bags (in the first picture) I got at CVS. Merry munchies folks!